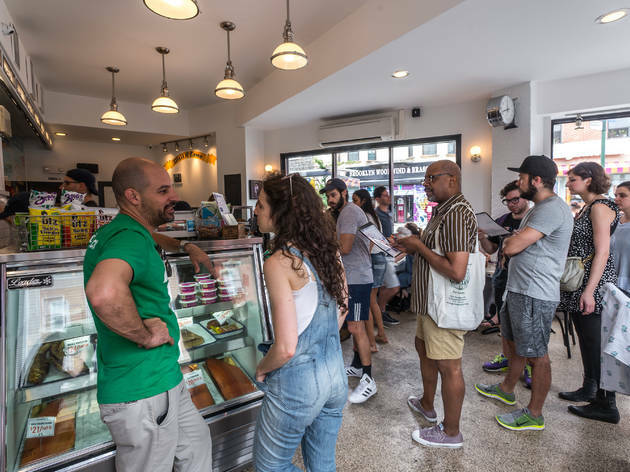 They say imitation is the sincerest form of flattery—if that’s the case, Russ & Daughters ought to be tickled as pink as its sliced Nova. 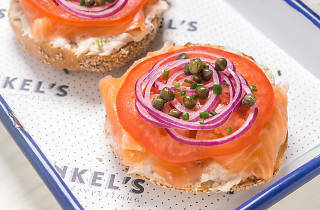 When Frankel’s—the latest in a neodeli revolution that brought us Major Food Group’s bagel bistro Sadelle’s and Alphabet City pastrami pros Harry & Ida’s this past year—opened on a Greenpoint corner in April, appetizing-store regulars were quick to kvetch about the joint’s design similarities to R&D down to the red-and-green neon signage outside and the exact font that advertises menu items like corned beef and chopped liver above white shelves stocked with matzo meal and U-bet syrup. 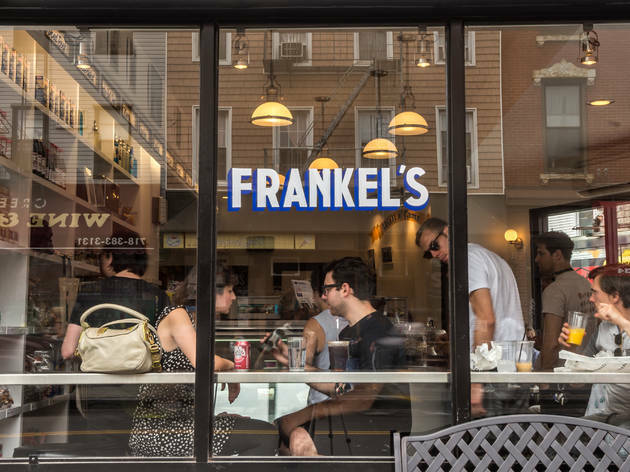 Frankel’s has since wisely swapped that copy-cat font for a royal-blue cursive, but the tributes go well beyond typeface: Raised on Jewish-food landmarks like Barney Greengrass and Zabar’s, brother-owners and Upper West Side natives Zach and Alex Frankel (former chef at Jack’s Wife Freda and half of Brooklyn synth-pop duo Holy Ghost!, respectively) preserve the traditions of their lox-peddling elders with menschy earnestness. 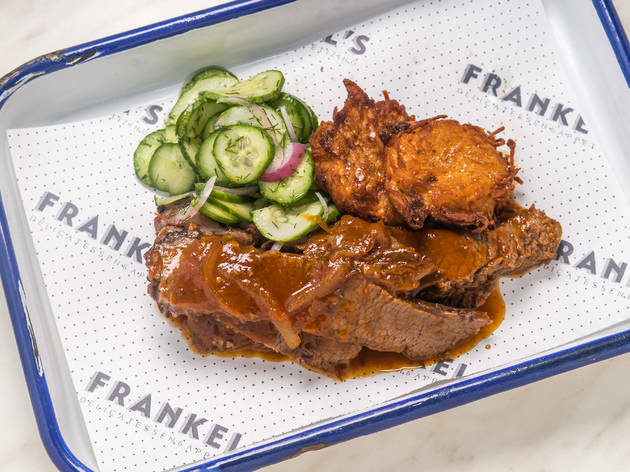 There are no revisionist latkes or molecular-gastro matzo balls here—just the deli staples they, and New York, grew up on. The malt-sweet, hand-rolled bagels come from Baz; the smoked fish (kippered salmon, sable), from Acme. 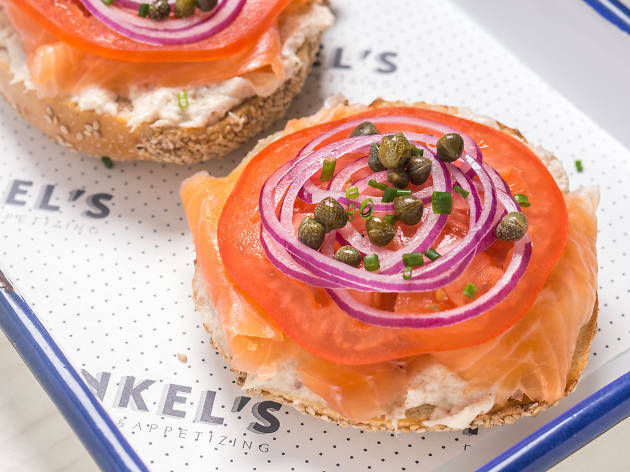 What Frankel’s gets right is the balanced ratio of its ingredients: ribbons of Irish organic salmon, equal parts oil and silk, has just enough fresh salinity and wood-chip smokiness to stand up to a creamy spread of whitefish salad and a few plucky capers on a bagel sandwich ($16). 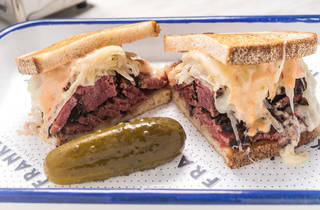 The shop’s hand-cut, thick-sliced pastrami is a fatty marvel; get it Reuben-style, dressed copiously with sauerkraut, Russian dressing and its own considerable juices on rye ($16.95), or more unexpectedly, in an egg-and-cheese sandwich ($8.95) that will make you wish your corner bodega had thought of it ages ago. 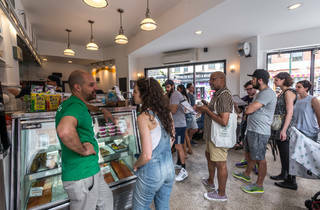 Not everything’s worth the trip—the matzo-ball soup ($6.95) is stingy on chicken and too liberal with dill—and prices are steep enough to warrant a smack on the head from Bubbe. 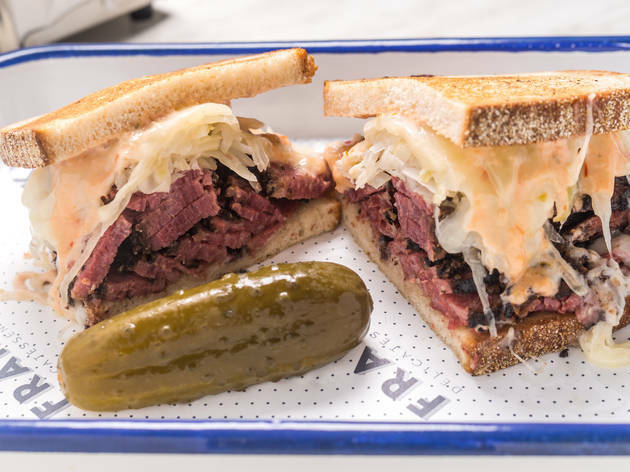 But it sure does look like a New York deli, and more importantly, it tastes like one, too. 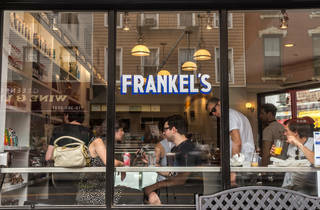 Ugh Frankel's is one of my favorite spots for breakfast or lunch, no matter the weather or occasion! My absolute favorites are their Potato Latkes, Tuna Salad, Matzo Ball Soup, Turkey Club, Pastrami/Egg/Cheese and their Nova Spread. Honestly, I don't think you could go wrong with anything on their menu. The only downside is that they close at 4pm, so if you're trying to snag some grub on your way from work you'll be very disappointed. 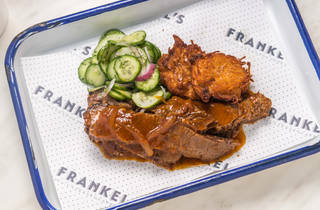 This (Frankel's) is in Greenpoint right?